This Burberry Gabardine Studded Shoulder Peplum Jacket is giving me LIFE right now. Yes I want it but I wont be paying the price that it goes for.. 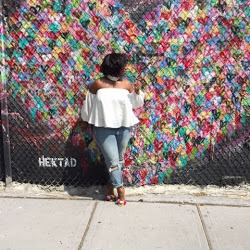 I can take an old leather Jacket & stud it up myself with the studs that I brought from Ebay.. I just might do that. 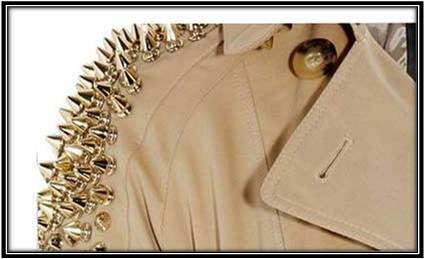 Check out this HWAT Jacket, which comes In beige with gold studs running down the shoulders to the arms. Also peep my FAV.. Monica rock'd this jacket a couple of weeks ago while sitting courtside at the Laker game. 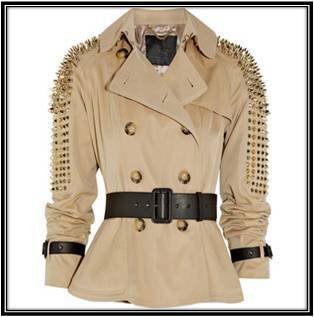 Lindsey Lohan & Kim Kardashian has also been seen wearing this jacket. Hey!! Loved this jacket when I saw Monica in it! I saw another model with it on last week!! I wish, I wish, I wish! !